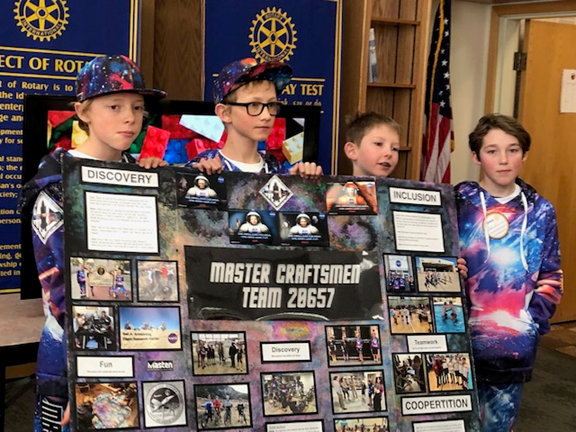 The Master Craftsmen - First Lego League team, comprised of 4 students from Mammoth Unified School District, made a presentation to our Club about their development projects and their recent success in winning first place in a robot building & demonstration competition in Reno, NV. The team also showed us a demonstration of how their virtual reality tool could be used to assist astronauts to maintain physical and mental health while on board the International Space Station (ISS). Above are Owen Call, Jude Howell, Jack Leonard and Wade Perry and the display they used in their winning presentation.